The National Court Reporters Foundation (NCRF) is now accepting nominations for the Frank Sarli Memorial Scholarship and the Student Intern Scholarship. The deadline for both these scholarships is Dec. 10. Beginning this year, both scholarship opportunities are open to NCRA student members enrolled in any court reporting program, not just NCRA approved programs. 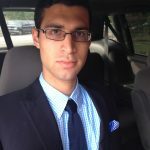 “I chose to be a court reporter because I wanted a job that has a relatively flexible schedule to permit me to do volunteer work and dedicate time to being a minister,” said Jared Orozco, a student from Sheridan Technical College in Hollywood, Fla., and recipient of the 2017 Frank Sarli Scholarship. “After I finish school, my ultimate goal would be to work in transcribing sermons to expedite their translation so it can be of benefit to people all over the world,” he added. Submit a nomination for the Frank Sarli Memorial Scholarship. 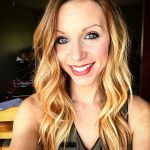 “Court reporting has always been the one job that has stuck out in my mind as my ‘dream job.’ I was always discouraged from going into this career because people are very misinformed about the opportunities available for a court reporter,” said Summer Vaughan, a student from College of Court Reporting in Valparaiso, Ind., one of two recipients of the 2017 Student Intern Scholarships. “Once I began my court reporting internship, I knew I was right where I had always wanted to be,” she added. Submit a nomination for the Student Intern Scholarship. NCRF’s scholarships and grant are supported by donations to the NCRF Angels Drive and other fundraisers. To learn more about these scholarships, and to find the nomination forms, please visit NCRA.org/NCRF. The National Court Reporters Foundation (NCRF) has announced that Cathy Carpenter, Orlando, Fla., was named recipient of the 2016 New Professional Reporter Grant. The Foundation also announced that Nicole Bulldis, a student from Green River Community College in Auburn, Wash., is the recipient of the 2016 Frank Sarli Memorial Scholarship. NCRF awards the annual New Professional Reporter Grant to a reporter who is in his or her first year of work, has graduated within a year from an NCRA-certified court reporting program, and meets specific criteria, including a grade point average of 3.5 or above, a letter of recommendation, and active work in any of the career paths of judicial (official/freelance), CART, or captioning. Carpenter, a graduate of Sheridan Technical College, Hollywood, Fla., is the 12th recipient of NCRF’s New Professional Reporter Grant. 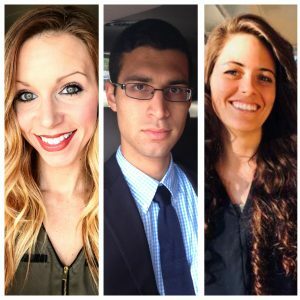 She was recommended by Chelsey Bailey of First Choice Reporting & Video in Tampa, Fla.
NCRF’s Frank Sarli Memorial Scholarship honors the late Frank Sarli, a court reporter who was committed to supporting students at the highest level of their learning curve. Bulldis is the 20th recipient of the scholarship. Recipients are chosen based on a number of criteria, including enrollment in an NCRA-certified court reporting program, passing at least one of the court reporting program’s Q&A tests at a minimum of 200 words per minute, having a grade point average of 3.5 or above, demonstrating the need for financial assistance, and possessing the qualities exemplified by a professional court reporter, including attitude, demeanor, dress, and motivation. The National Court Reporters Foundation has announced that Kendra Steppler, a student from Sumner College in Portland Ore., is the recipient of the $2,000 2015 Frank Sarli Memorial Scholarship. The Foundation also announced that Rachelle Cahoon, Boise, Idaho, was named recipient of the 2015 New Professional Reporter Grant. The winners will be recognized at NCRA’s 2015 Convention & Expo being held July 30-Aug. 2 in New York City. NCRF’s Frank Sarli Memorial Scholarship honors the late Frank Sarli, a court reporter who was committed to supporting students at the highest level of their learning curve. Steppler is the 19th recipient of the scholarship. Recipients are chosen based on a number of criteria, including enrollment in an NCRA-certified court reporting program, passing at least one of the court reporting program’s Q&A tests at a minimum of 200 words per minute, having a grade point average of 3.5 or above, demonstrating the need for financial assistance, and possessing the qualities exemplified by a professional court reporter, including attitude, demeanor, dress, and motivation. NCRF awards the annual New Professional Reporter Grant to a reporter who is in her or her first year of work, has graduated within a year from an NCRA-certified court reporting program, and meets specific criteria, including a grade point average of 3.5 or above, a letter of recommendation, and active work in any of the career paths of judicial (official/freelance), CART, or captioning. Cahoon, a graduate of the College of Court Reporting, Hobart, Ind., is the 11th recipient of NCRF’s New Professional Reporter Grant. She was nominated by Annie Cook of Tucker and Associates in Boise and was described as a “powerhouse” who is expected to become an amazing realtime writer. 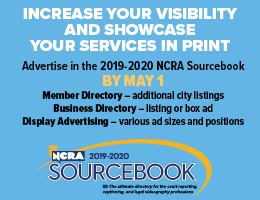 For more information about NCRA and its many programs, visit NCRA.org/Foundation. 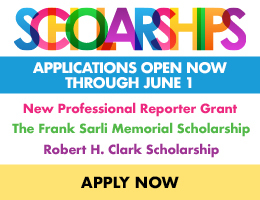 Nominations are now being accepted by the National Court Reporters Foundation for the Frank Sarli Memorial Scholarship and the New Professional Reporter Grant. The deadline for both the scholarship and grant is March 27. The Frank Sarli Memorial Scholarship of $2,000 has benefited court reporting students nearing graduation for nearly two decades. The New Professional Reporter Grant of $2,000 benefits a qualified new working reporter who has graduated from an NCRA-certified program within the past year. Both awards are based on nominations and recipients must meet a number of criteria. NCRF’s Frank Sarli Memorial Scholarship honors the late Frank Sarli, a court reporter who was committed to supporting students at the highest level of their learning curve. Sarli, who was studying to become a professional pianist, turned to a court reporting career when he could no longer afford the tuition to music school. During his career, he opened Accurate Court Reporters in Orlando, Fla., Orange County’s first independent court reporting firm, and was a founding member of the Florida Shorthand Reporters Association. Sarli also served in numerous roles at the national level, including as a director for NCRA. He was also the first Floridian to earn NCRA’s esteemed Distinguished Service Award. Both the scholarship and the grant are supported by donations to the NCRF Angels Drive and other fundraising events. Recipients will be recognized at the 2015 NCRA Convention & Expo., being held in New York City, July 30 – Aug. 2. Donations to the NCRF Angels Drive and other fundraising efforts support a variety of activities funded by the Foundation, including the $2,000 Frank Sarli Memorial Scholarship, which has benefited court reporting students for nearly two decades. “This scholarship helped get the ball rolling for my career. 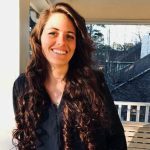 I used it to assist with the purchase of my professional steno machine and software,” said Justine Kiechel, from West Chester, Pa., a graduate of the College of Court Reporting in Hobart, Ind., and recipient of the 2014 scholarship. “Getting started can be expensive. The scholarship definitely made it a little less challenging in that area. It was also an honor to list it on my resume,” added Kiechel, who now works as a freelance reporter in Delaware. In a letter of thanks to NCRF, 2012 scholarship recipient Cynthia Garcia of Moreno Valley, Calif., a graduate of Sage College Court Reporting School in Southern California, stated that she also used the funds to help purchase a professional steno machine and software. In addition, she noted that being named a recipient helped motivate her to practice more while also building her dictionary. “One day I hope to be in a position to help students achieve their goals just as [NCRF] has helped me,” Garcia wrote. “This ever-important scholarship is made possible by the generous donations we receive each year from our members. The donations we receive are a clear reflection of how committed our members are to their profession,” said B.J. Shorak, the Foundation’s Deputy Executive Director. Recipients for the scholarship are chosen based on a number of criteria, including enrollment in an NCRA-certified court reporting program, passing at least one of the court reporting program’s Q&A tests at a minimum of 200 words per minute, having a grade point average of 3.5 or above, demonstrating the need for financial assistance, and possessing the qualities exemplified by a professional court reporter, including attitude, demeanor, dress, and motivation. “There’s really no reason a student shouldn’t apply for this scholarship. 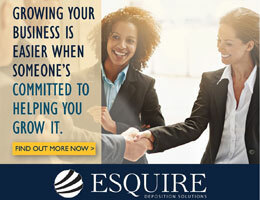 It’s a simple application process, and it can contribute to your future in the court reporting profession,” said Kiechel. Later this winter, NCRF will open the application process for students to apply for the Frank Sarli Memorial Scholarship, and the winner will be recognized at the 2015 NCRA Convention & Expo., being held in New York City, July 30 – Aug. 2. Learn more about how you can help support the Foundation’s work including the Frank Sarli Memorial Scholarship. In 2014, NCRF awarded scholarships to three students and a grant to a new working court reporter. Two students, Kelly Greer of the Community College of Allegheny County, Pittsburgh, Penn., and Rebecca Russo of Gadsden State Community College, Gadsden, Ala., received NCRF’s Student Intern Scholarships; each received $1,000. 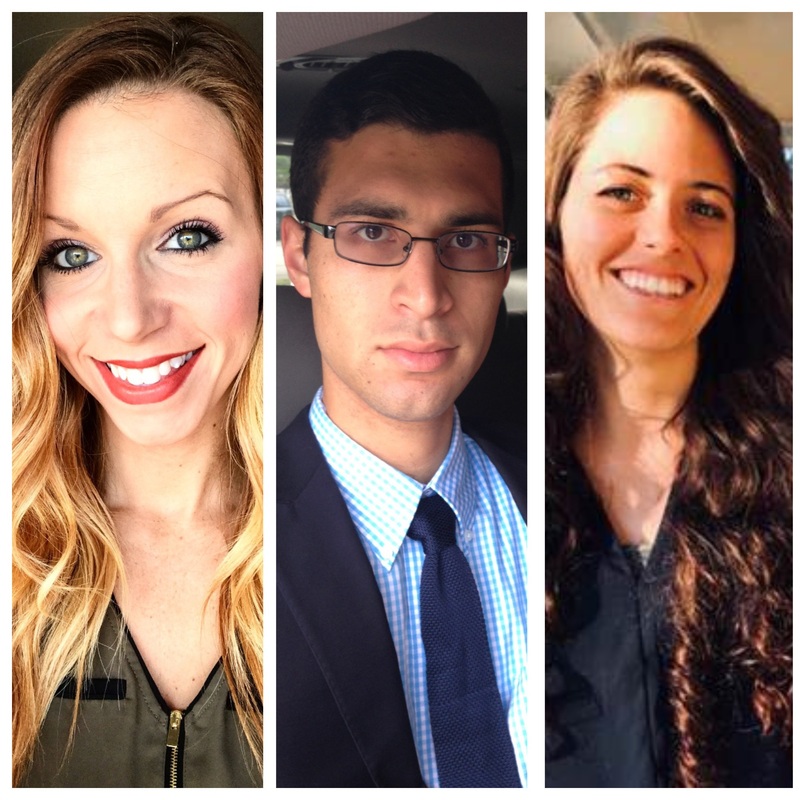 Jessica D’Agostino of Lake Worth, Fla., was awarded NCRF’s 2014 Frank Sarli Memorial Scholarship, and Shannon Bevin, a court reporter from Whitestone, N.Y., is the 2014 recipient of NCRF’s New Professional Reporter Grant; they each received $2,000. Read more.